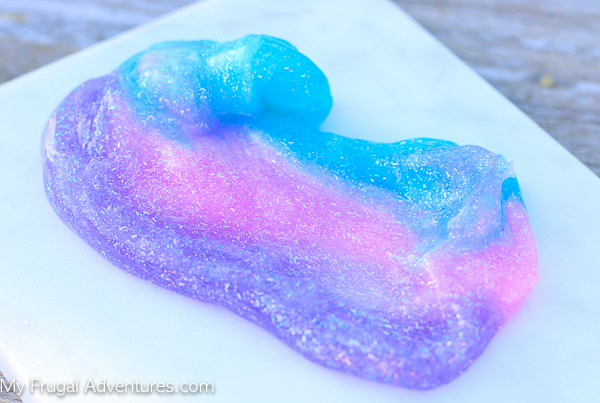 I have a super simple and fun children’s craft idea for you to make unicorn slime (without using Borax). 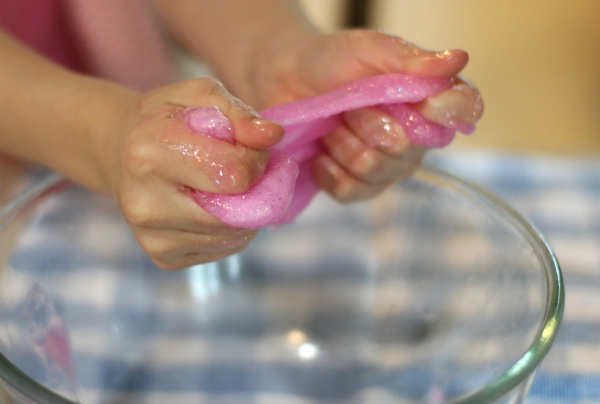 Slime is just always a win with my girls- it is quick and easy to make and there are so many fun and creative variations to give yours a unique twist. 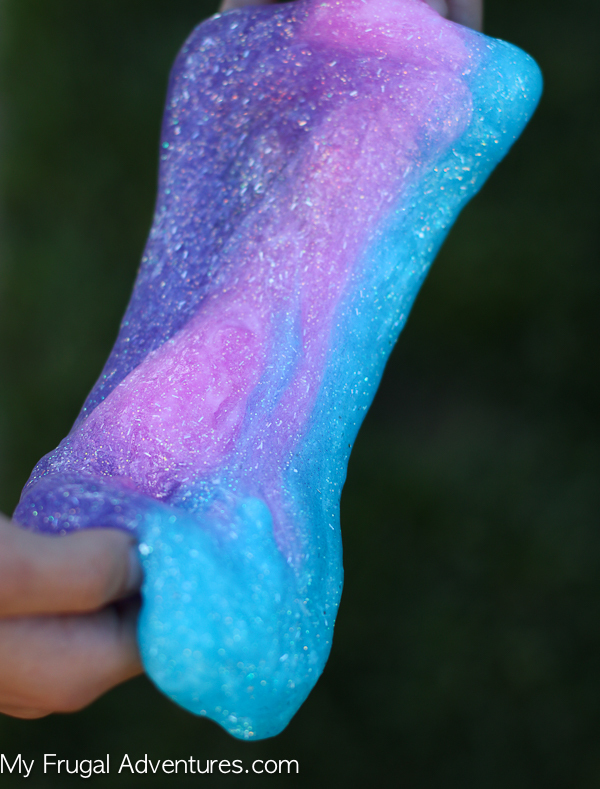 I wanted something bright and cheerful and playful for Spring and decided to make a glittery, rainbowy, unicorn slime and it was a huge hit with my kids. 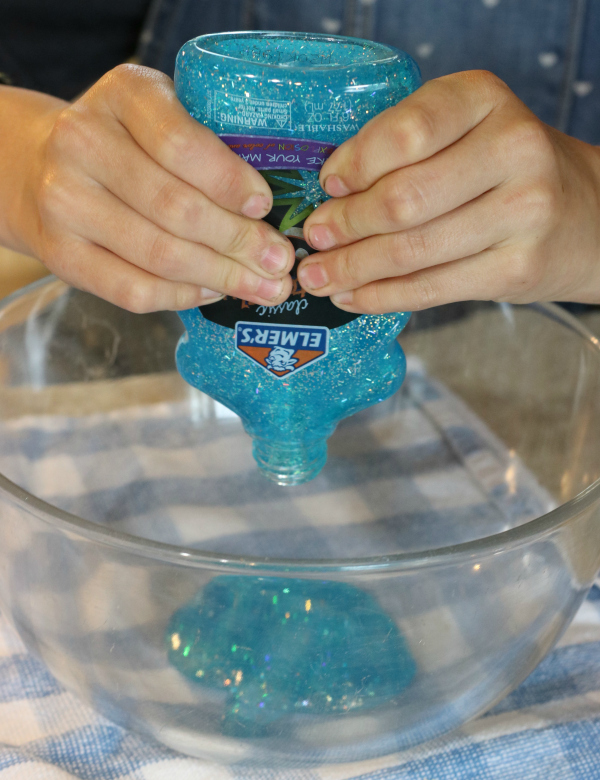 There has been some negative press about slime with Borax and I have posted a slime with borax recipe, a slime with no borax and now I wanted to try a different recipe and see how that worked out. We used contact lens solution for this recipe and it turned out pretty well! Fairly comparable to the other slime recipes but a little easier to mix together. 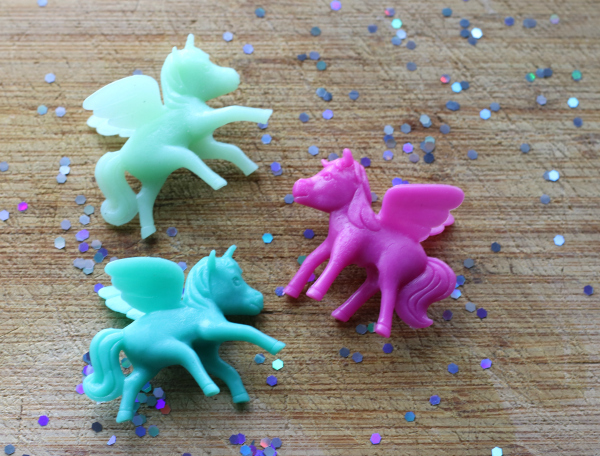 Mini Unicorns are optional- I found mine once upon a time at the Target Dollar Spot but here are a bunch to choose from online . Easy right? Now you simply add the glue to a bowl- our glue was 6 oz so I just guessed at the 4 oz mark. Next add the baking soda and mix well. 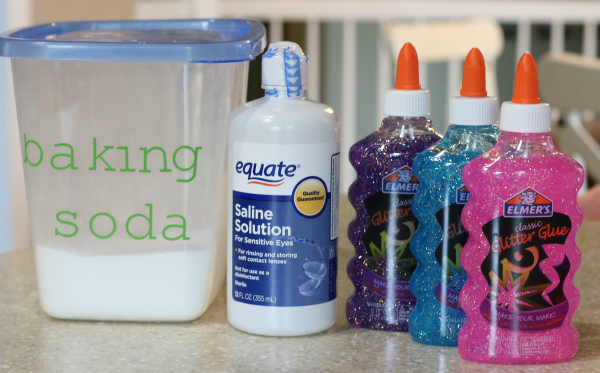 If you use white or clear glue, now is the time to add any food coloring you might like. I used blue, purple and pink glitter glue so no coloring was needed. Last add the contact solution. Mix really, really well. This is sticky and messy but after kneading the slime should come together well. Here is the slime after making (3) batches one per color of glitter glue we had. I took the lump of slime and rolled it out into a snake shape. Once all three were rolled out, I placed them side by side and just rolled them together to create a swirly, rainbow. 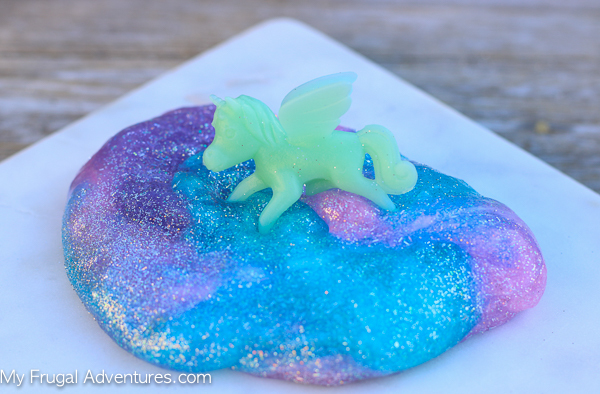 To make this a little more fun, I purchased some mini unicorns and we added a little extra glitter to the slime. My girls really got a kick out of this. 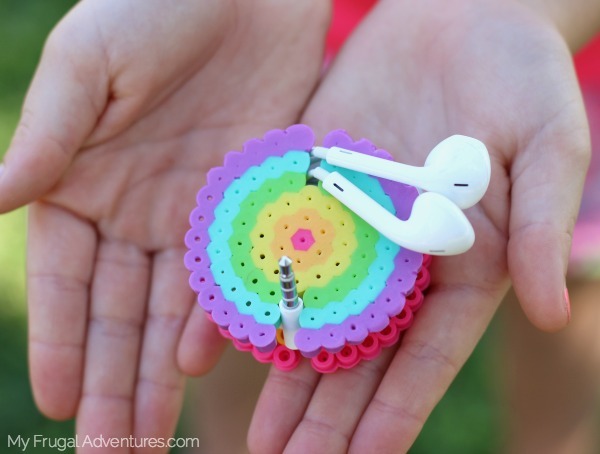 This would be a really cute party favor- I can see adding the slime to a clear treat bag, tying with ribbon and one of the unicorns around the top. Easy and cute. If you decide to give this recipe a shot, come back and let me know what you think! *Very Important Note on the Contact Solution. 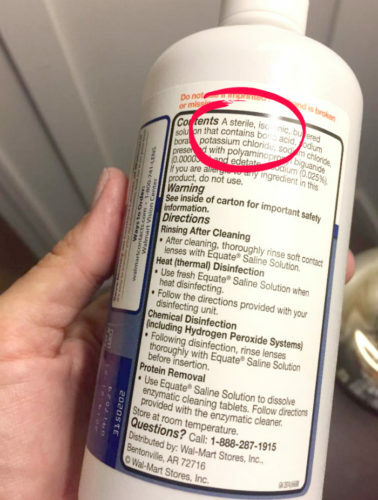 Be sure to read the label and only purchase contact solution that contains boric acid. If it does not contain boric acid you will need Borax to get the slime to come together. Thanks to reader Amy for pointing this out! Some people have had DIY slime fails. I am not sure what is going wrong but I suspect it is an issue with the type of contact solution. 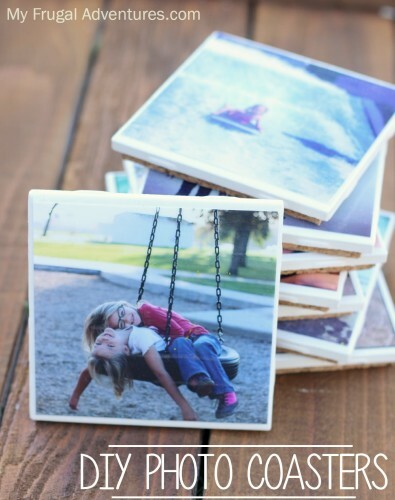 I can say for sure that the Walmart store brand pictured above does work beautifully. This is great! Worth noting that the boric acid in the solution is like borax. And there’s nothing wrong with using either as long as you don’t overdo it! I also add a tiny bit of baby oil at the end to stop the slime from sticking to fingers. Baby oil is a great idea! I don’t have contact solution . what doI do??? I don’t have contact solution. What do I do now??? Hi Iyana- you can use laundry soap like Tide or Fabric Softener or Borax mixed with water instead of contact solution as the activator. Liquid Starch is what I use. Much cheaper, sold at Walmart. I don’t like Borax either because of the power flying around but if you premix it’s fine. It all has Boric Acid. Love the unicorn idea! Hi! I was wondering where you got the mini unicorns from? My daughter is having her unicorn themed party this Saturday. Thanks!! We tried the contact lens solution recipe. 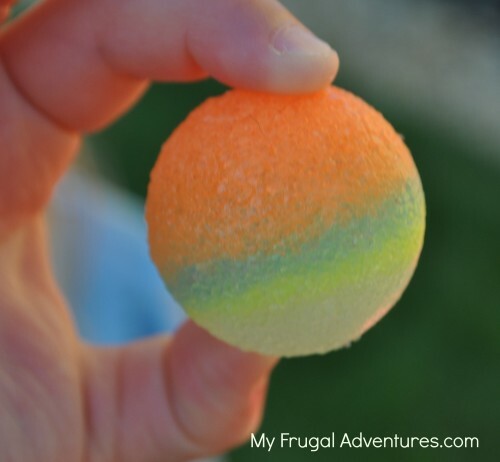 Easiest slime ever! Easy cleanup too! Very happy to hear that Kathie! Thanks for sharing! Thank you for publishing this recipe! How much glue do you think I would need if I wanted to make enough for 10 girls? Hi Katie! Gosh… For 10 girls you might be better off with a gallon of clear glue and then making three batches of colors. That recipe with the smaller bottles of glue you would probably need to multiply by 5 or so to have enough for everyone. How much slime does this recipe make? I’m thinking of doing this for my daughter’s unicorn birthday as a little party gift for the kids. So happy to hear that! Good luck tonight!